Abt Electronics of Glenview, Ill., has taken warehouse retail to a new level with a 358,000-sq.-ft. (33,258-sq.-m.) facility combining high-tech electronics retail with high-tech warehouse, distribution, and office space. 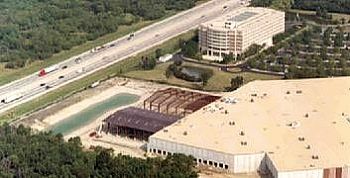 Built by Skokie, Ill.-based Alter Construction Company, the facility stands on a 30-acre (12.1-hectare) site bounded by two major highways that accommodate outgoing and incoming shipments of goods sold through a 58,000-sq.-ft. (5,388-sq.-m.) showroom and a physically smaller but equally busy Internet sales operation. Abt markets electronics products, from television sets with plasma screens to home theaters, from sound systems to refrigerators and other white goods. Products are merchandised in showroom specialty shops set beneath a spectacular glass-walled atrium. Retail store finishes include granite flooring and marble columns. Behind the scenes, a 200,000-sq.-ft. (18,580-sq.-m.) ware house and distribution area powers the retail operation. Eight docks accept incoming shipments, which fill the retail displays and bulk storage areas in the warehouse. Across the way, three "fingers" with cross-docks shoot out into the truck yard. Just over 80 loading docks line these fingers and send products off to customers. A manual picking operation in the 28-ft. (8.5-m.) clear height warehouse delivers products to the finger-docks for shipping and to the store. The Abt Electronics facility in Glenview, Ill., is much more than a warehouse. It also houses an Internet sales operation and a retail showroom, as well as a natural gas co-generation plant. there are many unusual features. We brought in 4,000-amp service from the local utility company. This was necessary for the electronics displays and the computers running the Internet sales operation. The building also has a natural gas co-generation plant that produces electricity during the day and helps control electricity costs. It's a one-of-a-kind facility." ©2003 Conway Data, Inc. All rights reserved. SiteNet data is from many sources and not warranted to be accurate or current.